We will make every effort to contact you quickly, but please give us at least 48 hours before you become frustrated. (We might be in the warehouse, or out on the road at a show!) Our web site, blog and voice mail are available 24 hours a day, seven days a week. e-mail, which we check and answer several times every business day. We want to make sure that you have a positive shopping experience on our site. Offering you quality vintage knives, and other merchandise in a timely manner is our goal. If there is anything we can do to serve you better, please contact us at the below address, phone or email. is the Catalog and Price List. We are on Central Standard Time (CST) starting on the first Sunday in November and ending on the second Sunday in March. The complete months of December, January and February are on Central Standard Time. We are on Central Daylight Saving Time (CDT) starting on the second Sunday in March and up until the first Sunday in November. The complete months of April, May, June, July, August, September and October are on Central Daylight Saving Time. Like to know more about Daylight Saving Time? Click here. World Time Zones for your time anywhere on the Earth. How old is my knife or sword? Who made my knife or sword? Click here for answers before calling. Business Hours We are in the Chicago and Dallas time zone. We are normally in the office - see Business Hours above. We will get back to you as soon as possible if we miss your call. Click here for appraisal help. Appraisals are $35 each. We do not repair knives or have knife parts. Outside of business hours please leave a detailed message on the product you are interested in, your call-back number, the best time to call and our order number. By letting us know what you wanted we can let you know if we still have the item or other information. Tell us which knife or knives you want to buy because it is in your interest to do so. We generally only have the one you are looking at in the photo for sale and when it is gone we do not have and can not get any more. Tell us what more information you need on one of our knives. Please do not leave a vague message saying that you are interested in a knife or other product but not which one. We will email or call you, let us know which you prefer. If you are outside the USA (48 states) please use email. We no longer publish an email address because of all the spam emails we receive. We were receiving over 200 spam (bad email we do not want) emails every day which was taking to much time to go through to get the important (good email we do want) email our customers sent us! is worth? Click here for answer. We do not have a Product Catalog or Retail Price List. The web site is the Catalog and Price List. Information about where to e-mail us about problems with any page or Cutlers Cove site. Please send us the exact URL for the page you were on when you selected the bad link and let us know what page you were trying to get to. Use the Site Map like a Table of Contents. Emails sent to CutlersCove.com regarding warranty and repair issues, will not be forwarded to the correct manufacturer, and will not be answered, sorry. Click here for warranty and repair issues for your knife, sword or cutlery. Cutlers Cove does not make repairs and we do not have parts to fix your knife. Through our partnership with Amazon.com, we are offering an exclusive Cutlers Cove version of the award winning Alexa Toolbar. With the toolbar you can search the web, using their amazing search engine, right from your toolbar. 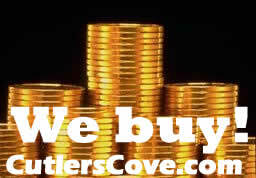 Plus, when you download and use the toolbar, you'll help support Cutlers Cove.